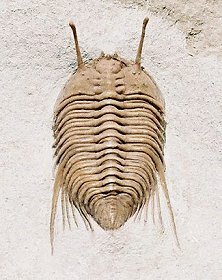 Size: Trilobite is 2.2" long, not including eyes! This is a beautiful example of an unusual Ordovician trilobite. It is a large Cybele panderi from St. Petersburg, Russia. This type is well known for its long, stalked eyes, which are free-standing and prominently displayed on this specimen. This type also has long pleural spines near the pygidium - this specimen also has these spines intact. The outstretched trilobite is very inflated and 3-D and has excellent detail preserved. The colorful trilobite is beautifully showcased on the large, natural block of limestone that also contains a large, coiled gastropod. This is a very collectible AND displayable example of this highly uncommon needle-eyed trilobite from Russia.